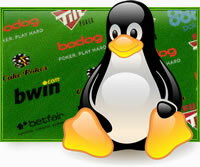 Poker players that use Linux have various options to play online poker. Linux poker players can use a poker rooms “Instant Play” software, perform a Dual Boot, or try installing Wine on Linux (be careful). All three options can be performed and we have given instructions on how to perform all options down below. Most poker sites either use .exe or .dmg so it is difficult to find a Linux compatible poker site that uses the .ISO format. Always look for something that doesn’t require downloading. It will say instant play, or no-download. As of right now there is NO US ACCEPTED LINUX POKER SITE. BetOnline.com used to have a Linux OS version but it has been disabled. They have told us their Linux poker software is being worked on and should be out soon, so bookmark this page if you want to stay updated. Please note, Java poker sites are not available in the USA. The no download poker rooms that run instantly on Linux are listed above. The only requirement to play these free Linux poker rooms is to have Java installed. On the homepage of most poker sites you will see a button for “Instant Play” or “No Download”. That is what you need to play on Linux. Some Linux poker players have had success installing Wine at certain poker rooms. Wine lets you run a Windows based poker room using Linux but only some rooms are compatible. We have listed detailed instructions on how to install Wine and what poker rooms are compatible at the Wine poker install page. Pokerstars is a popular choice for poker players outside the USA when using Wine. Installing Wine is popular because it is free. The third option involves performing a dual boot which allows Windows and Linux to run on the same computer but not simultaneously. You should be careful with this option and backup your computer beforehand. This is a decent option if you already own a version of Windows otherwise you will have to buy a copy. More instructions about Dual Booting Linux are below. Let’s go a little more in depth about these three options. They all have their pros and cons and neither one is perfect. Java aka “no download” sites tend to be the most standard way to play poker on Linux. This method allows users to instantly play on most all operating systems including that of Linux. Java also allows for playing poker on Macs. While this method may provide for quick and free access to the poker table it does not provide everything you want for playing poker. All the little accessories, graphics, and features tend to be stripped in these Java sites. Things like table sorting, avatars, and superb graphics usually can’t be found when using Java. It’s like driving a Ferrari and having to roll the windows up manually. Instead use Java to test out playing poker online. If you decide you like it and want to further playing at other sites then try some of the other options available to you like the ones we list on this page. We’ve tested Party Poker on Linux with the Java version and that so far has proved to work quite well. This approach can get a little complicated. For most Linux users it’s hard to get excited about having to switch back to Windows but it does the job. Dual Booting involves operating both Linux and Windows on the same computer. It seems a lot of users seek Linux as a haven from the monopolistic Microsoft products. For these reasons most Linux poker players decide to bypass the Dual Booting process to play online poker. Dual booting commonly referred to as “Partitioning your hard drive” can be risky with the potential of lost files. Due to complexities of Dual Booting Linux various steps should be taken to yield a positive outcome and to protect your computer so you can be on your way to happily playing poker on Linux instead of figuring out what the heck you did wrong. Because of this we suggest taking a look at the Linux Dual Boot process if you decide this is the route you would like to take. The software designed for casino players is very similar to poker software, thus online casino players can perform many of the same concepts that we just explained. Casinos will usually run Flash instead of Java but using Wine and Dual Booting can also be done. Wine is becoming popular to play poker on Linux and seems to becoming more popular. I think Wine is growing in use to play poker because it’s free to download and keeps Linux users from having to advert back to Windows. What exactly is Wine? Wine is somewhat of a compatibility foundation that provides users with the capabilities to run Windows applications without actually having the Windows operating system. Not all poker rooms run perfectly using Wine. Common problems when using Wine to play poker on Linux include sound problems, some feature malfunctions, and problems exiting the poker rooms. These problems are often debugged by the seasoned Wine users. I would recommend Wine for the Linux user who likes to tinker with new systems and enjoys a little challenge. We offer some technical help for Linux / Wine users but due to so many upgrades in Wine not every system can be supported.